Parties submit lists of candidates for Knesset, Jewish Home list does not include Eli Yishai. 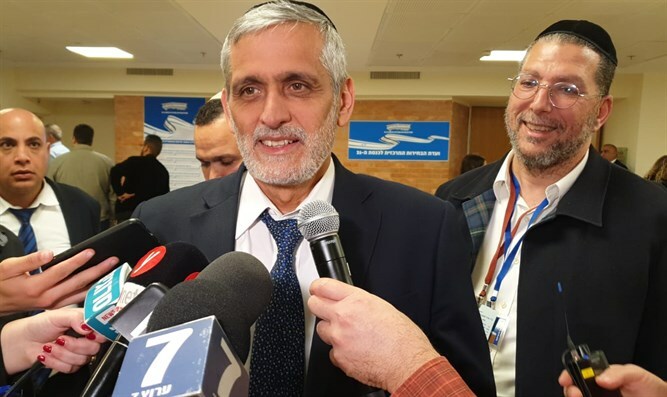 Former minister Eli Yishai, who chairs the Yachad party, tried to make an arrangement with the Jewish Home party under which the two parties would run together but remain separate. National Union Chairman MK Bezalel Smotrich refused Yishai's offers and said that from the party's perspective, he can vote for various issues however he wants, but Yachad cannot remain an independent party. A few minutes later, the parties submitted their lists of candidates for the next Knesset. The option of Yishai being able to serve as a minister without being an MK is being investigated. Earlier this week, it was expected that Yishai would be placed sixth on a joint list including Jewish Home, National Union, Otzma Yehudit, and Yachad. However, talks fell apart and by Thursday, it was expected that Yishai would end up running alone.